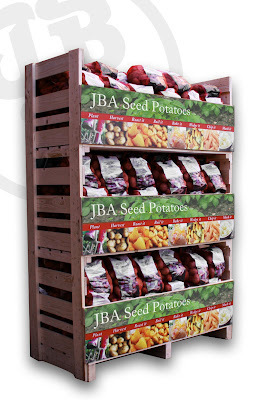 Here is a first look at the new JBA display stands. Each stand can hold over 200 pack of 2.5kg nets and will be available for the 2010/2011 season. These stands will allow the customer to have easy access to each variety whilst taking up the smallest amount of valuable floor space possible. Today I managed to get a chance to prepare my seed potatoes for chitting. I have around 100 varieties that I will grow using my simple polypot system. I like to keep things organised so I put them all in trays and seperate them with cardboard that has the variety name written on. I think my favourites are the NVS Amour and the Pink Duke of York look tremendous. The secret to chitting is to remove the Rose eyes from the potato and leave the side shoots to grow. Today we sent out the last of pre-orders and are up to date with all orders. In a year that has seen our business quadruple in size it has been a huge achievement to get all the orders out on time as promised. We are now looking to the future and will be looking for highly skilled staff to join us. If you think a career in seed potatoes would be of interest then send me an email with all your details on my contact form on my website. I rushed down to the shops today to buy the latest edition of Kitchen Garden magazine. I ripped it open and found a 4 page spread all about our company and what we do here. It is a great read so get down to your local newsagent and buy the March edition now.